For iPhone users seeking a wrist-worn fitness tracker with GPS, heart rate monitoring, and multiple-day battery life, the Fitbit Surge is a good "tweener" device —not quite a smartwatch, but much more functional than a basic wearable. 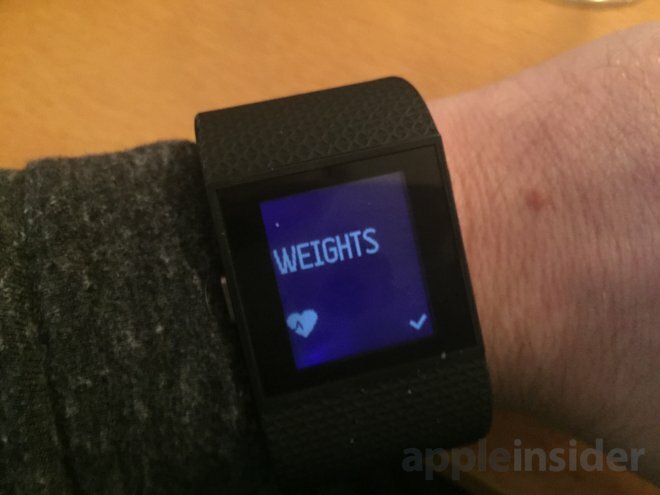 AppleInsider has been testing the Fitbit Surge for a few weeks now, using it for daily step counting, run tracking, heart rate monitoring at the gym, and even while skiing. We're generally pleased with the performance of the device, though at $250 —just $100 less than the starting price of an Apple Watch —it seems targeted specifically at people who do not want a full-fledged smartwatch. Fitbit has smartly taken to marketing the Surge as a "super watch," a clever way of telling consumers that it doesn't intend for the device to be a direct competitor to the likes of the Apple Watch or Android Wear. Still, for a wrist-worn device, the Fitbit Surge boasts an impressive feature set. Its monochrome black-and-white display allows multiple-day battery life, yet the Surge also includes touchscreen input, putting it a step above the button-controlled Pebble. Perhaps the strongest selling point of the Surge is the inclusion of GPS for run tracking. Like the recently released Microsoft Band, integrated GPS allows users to track their run speed without the need to have their iPhone strapped to their arm, giving these products a leg up on the Apple Watch in that respect. But the Surge does not offer any third-party app support, and iPhone-connected smartwatch functions are limited to texts, calls and music control. 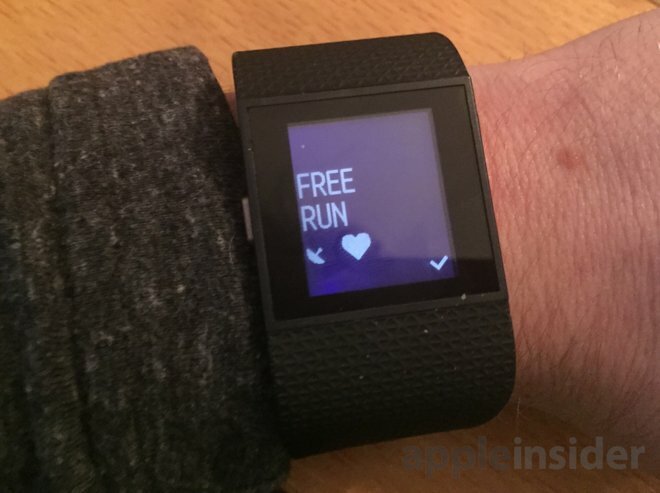 The design of the Fitbit Surge is functional, if uninspiring. The black and white display is backlit and of adequate resolution, controlled by a responsive touchscreen that's aided by two input buttons on the right side, and a back button on the left. The device is attached to the wrist with a comfortable rubber band. What the Surge lacks in appearance we found was made up for in comfort, which was nice when doing activities like jogging or lifting weights. This stands in contrast to the Microsoft Band, which we found to be clunky and uncomfortable, with an elongated display better suited for viewing from the inside of a wearer's wrist. Unfortunately, the Surge is water resistant, but not waterproof. That means while you can get it wet in a light rain or with sweat, you shouldn't swim or even shower while wearing your Surge. If your workout routine involves swimming laps, look elsewhere. Fitbit says the Surge can offer up to seven days of battery life, but we presume this is accomplished by not using GPS or disabling automatic heart rate monitoring. In our tests, with semi-regular GPS use and automatic heart rate monitoring enabled, we'd get about three days before the battery started to get low. Turning the watch off at night extended the life a day or two beyond that. From the main screen, users can swipe left or right on the Surge's display to view the time, daily steps, current heart rate, miles walked today, calories burned, and floors climbed. Pressing the back button on the left side takes users to the main menu, where they can choose the default workout (which is set to "Run" out of the box), choose a different type of workout, set a silent wrist-bound alarm, and modify settings. In the settings, the backlight controls can be set to automatic based on usage/alerts when access in the dark, or the backlight can be permanently set to on or off. Users can also choose to set heart rate monitoring to automatic, on, or off. 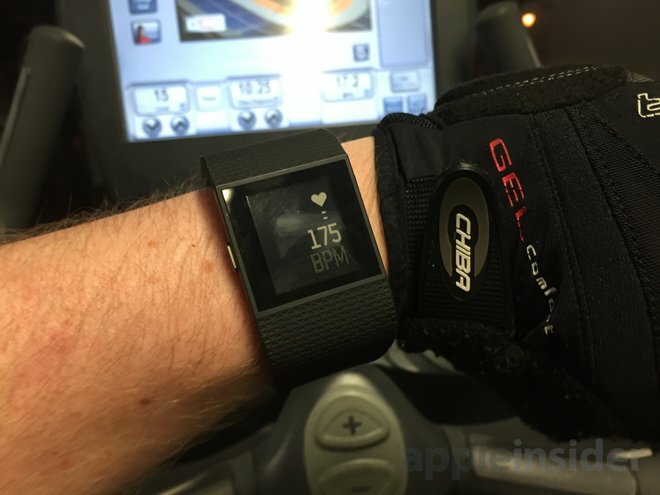 When heart rate monitoring is on automatic, there can be a minor delay—ï¿½for example, we got started on a stationary bike at the gym, but it took a few minutes for the Fitbit to measure our heart rate and provide us with a new average BPM. GPS can also take a few minutes to lock on for a signal before a run, which is a flaw with GPS itself and not the Fitbit. An iPhone or other smartphones find location more quickly through cellular signal triangulation, Wi-Fi and other means, offsetting the slowness of a GPS lock. 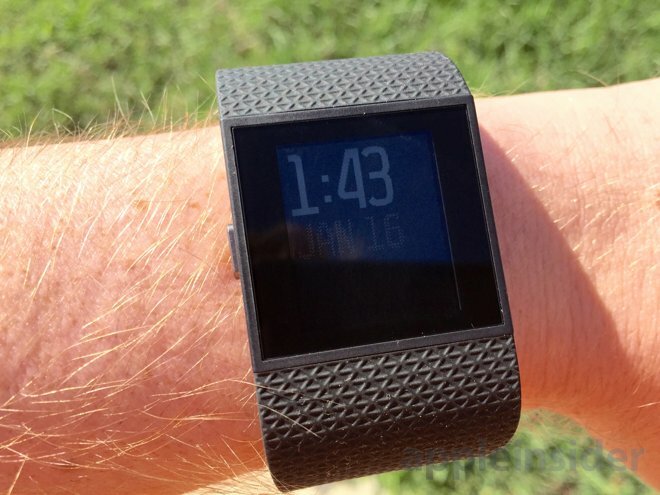 Overall, the design of the Fitbit Surge —aesthetic preferences notwithstanding —is great. It's comfortable, responsive and durable. Unlike the Microsoft Band, accumulated scuffs on its display very easily, we found no such scratches after weeks of use with the Surge. 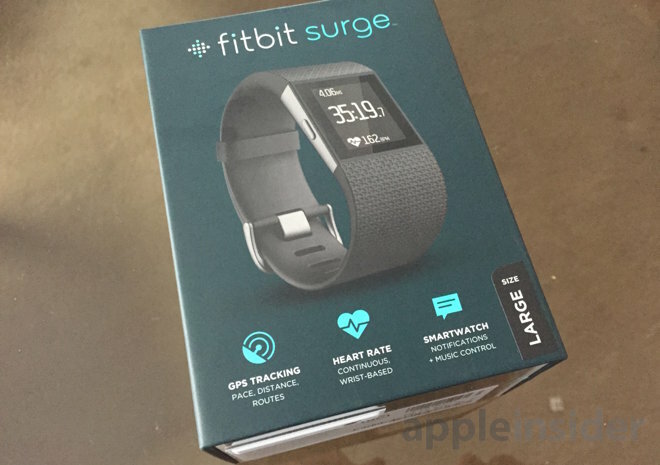 The Fitbit Surge connects to the official Fitbit app for iOS, which syncs step and fitness data to the company's ecosystem. The step tracking and syncing works largely as expected, and users can enable automatic syncing within the app to have their steps updated without the need to launch the app. The smartwatch functions of the Surge are limited, unfortunately. The only notifications that can be seen on the wrist, at the moment, are text messages and phone calls—ï¿½that means no third-party messaging apps, no Facebook or Twitter alerts, and no iCloud Reminders or calendar entries. For text messages, the Surge only displays the person's name at the top of the screen. Users can read the text —but only up to 160 characters of it —by swiping down from the top of the display. If your hands are full, or you're wearing gloves, and don't swipe the screen within seven seconds, accessing text messages requires users to first press the back button to go to the menu, and then choose the top right button to select message history. We found this to be less useful than devices like Pebble, Meta or the Microsoft Band, which automatically display texts as they are received. These seem like issues that could be easily fixed with a software update to the Surge, and we're hopeful Fitbit will consider making the device a little smarter and more handsfree. One welcome inclusion the Surge does have is music control through a "Bluetooth Classic" mode. Setting up music control requires a few steps to pair the watch with the iPhone, but we never had issues reconnecting after the initial pairing. Bringing up media controls requires simply double-pressing the left back button on the Surge. Users are then shown the artist and title of the currently playing track, and the top right button is a skip forward control, while the bottom right button handles play/pause duties. We found ourselves really enjoying the music control functions of the Surge, particularly the ease with which they could be accessed. Microsoft's Band does not have music control, and some other smartwatches we have tested in the past would require multiple button presses or menu scrolling to bring up music controls. Finally, it's well-known that the Fitbit ecosystem does not yet integrate with Apple's HealthKit, and may never. This is a nearsighted decision by Fibtit that we hope the company will change its stance on soon. As a longtime Fitbit user, I feel compelled to question the company's policy that only one step tracking device can be used at a time for an account. While the Surge is fine to wear at the gym, it's not the greatest looking watch we've ever seen, and users might be inclined to use a more discreet device, like the company's pocketable One, for different occasions. Fitbit also allows users to utilize the step counting capabilities of recent iPhones to track their daily progress. This would be another ideal option for certain situations. Unfortunately, because Fitbit only allows one hardware device to be connected to an account at a time, it's just not possible. If you want to change your Fitbit device, all of the steps counted by the previous device for that day are erased, making regular switching a no-go. Simply put, there is no way to seamlessly switch between wearable devices in the Fitbit ecosystem. This is a mistake for consumers who might want options, and frankly it's also a mistake for Fitbit, which could sell more hardware. As wearable devices mature, companies like Fitbit will need to take a hint from the fashion industry, as Apple had done with its forthcoming Watch. One wearable device simply cannot be appropriate for all occasions, and if Fitbit wants to stay relevant, it should offer more flexibility. If it seems like we've spent a lot of time comparing the Fitbit Surge to the Microsoft Band, it's because both devices occupy the "tweener" role of wearables that aren't quite full-fledged enough to become a modern smartwatch like the Apple Watch. Both also include integrated GPS and heart rate monitoring, along with the usual step tracking. Microsoft's Band is $50 less, and it offers more features like a UV sensor, notifications from third-party iPhone applications, RunKeeper and MyFitnessPal integration, a color touchscreen, and guided workouts. 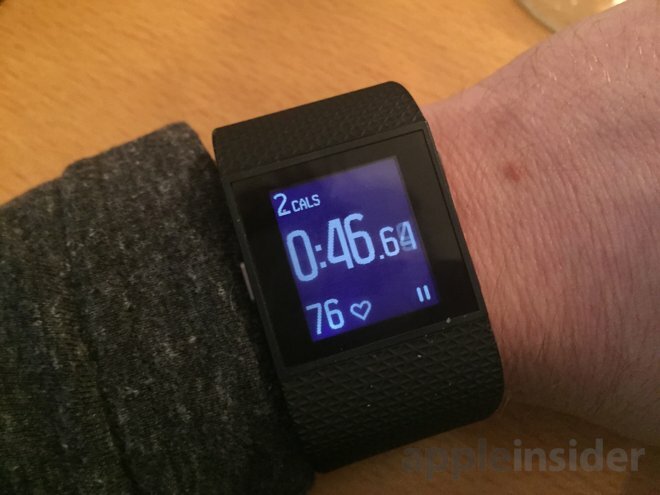 The Fitbit Surge is more comfortable than the Microsoft Band, it gets much longer battery life, it can control your iPhone's music, and it integrates with the popular Fitbit ecosystem. Is it worth the extra $50 over the Band? For the comfort and battery life alone we'd say yes, though we'd like to see more smartwatch functions (such as notifications from more apps) added in future software updates. As with the Band, the key feature that gives the Surge a leg-up on the forthcoming Apple Watch is the inclusion of GPS, allowing users to go for a run without their iPhone strapped to their arm or otherwise. 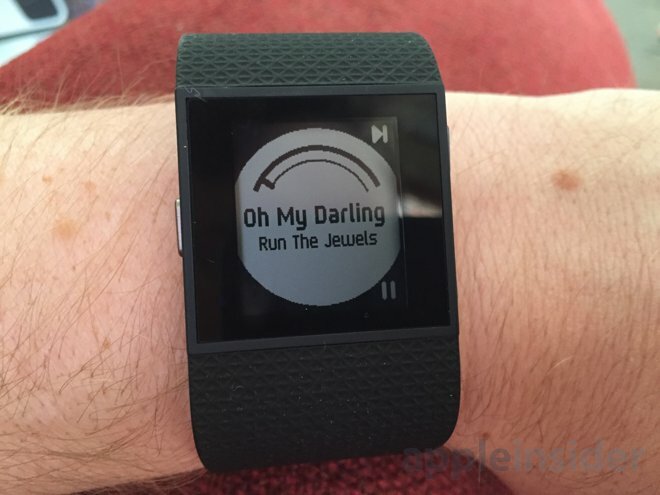 If this appeals to you, the Fitbit Surge is a respectable choice. But if you're considering the Apple Watch, or any other more fully featured smartwatch with apps, customization and a variety of uses, look elsewhere. The novelty of text messages and calls on your wrist simply pales in comparison to what modern smartwatches are capable of. Viewed in the light that Fitbit intends —as a fitness-focused wearable —the Surge can be considered a success. Just don't call it a smartwatch. The Fitbit Surge is available for $249.95 in sizes of small and large at Amazon.com. It can also be purchased direct from Fitbit.